"I love this country! God Bless America! USA! 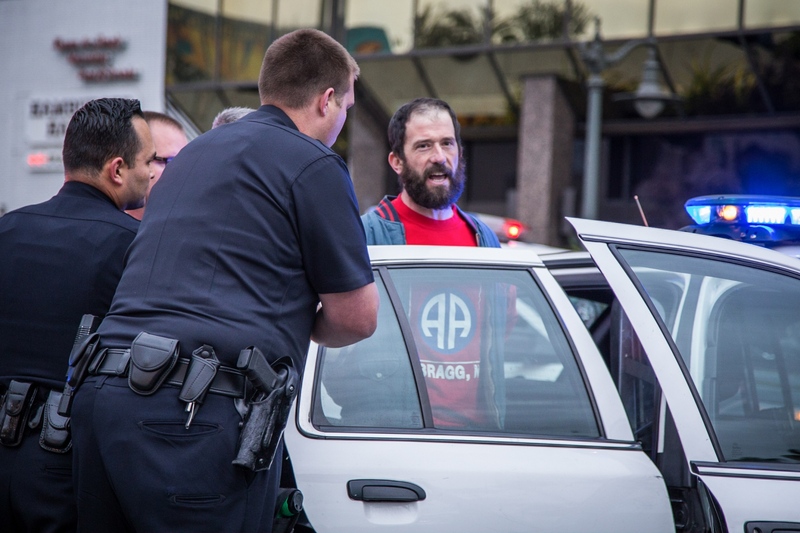 !” That’s what war veteran Aaron Levy kept yelling at police. 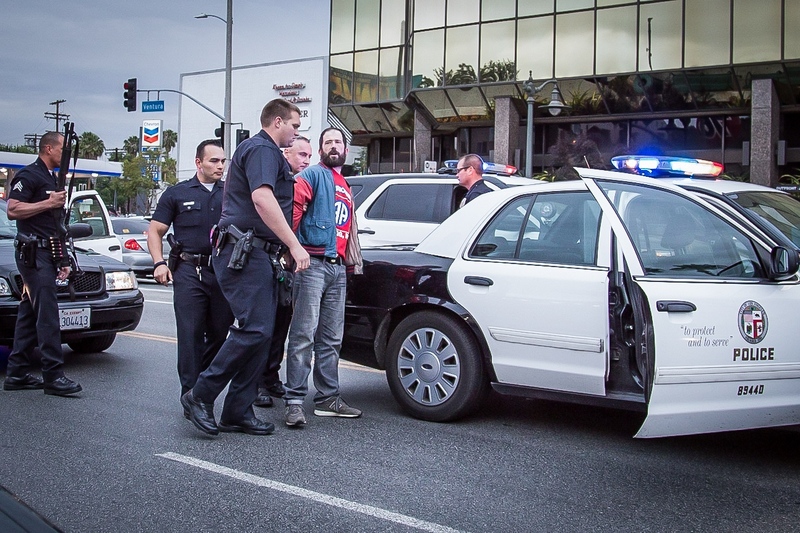 The 38 year old Southern California man led police on a slow speed pursuit on Ventura Boulevard. I was leaving a restaurant when I spotted Levy in his 2004 Ford Mustang convertible. He saw me, honked and flashed the peace sign. He was doing that to other bystanders. On the passenger door, there was a sign that read, “Victory. 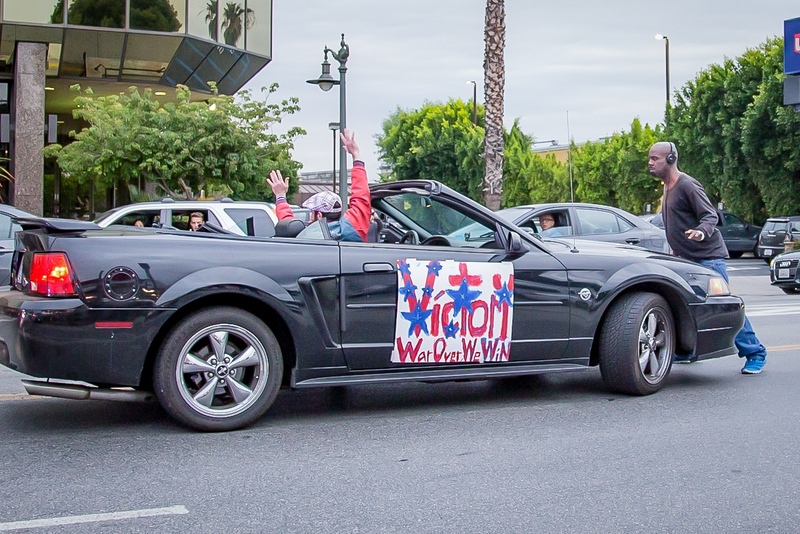 War over, We Win.” Trailing behind Levy were 7 LAPD cruisers. I immediately grabbed my camera and began photographing the chase. The highest speed during the pursuit was 10 mph. 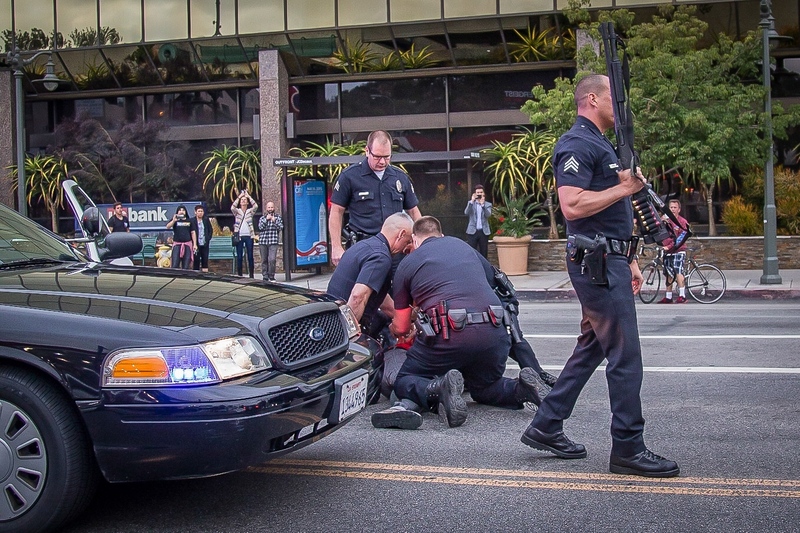 After about an hour, it was a homeless man, not the police who brought the chase to a peaceful end. 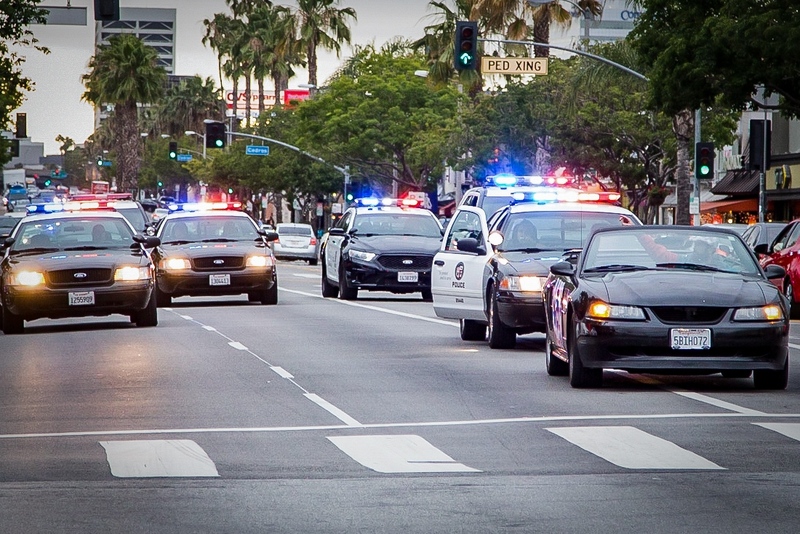 An unidentified African American man with headphones and a portable CD player in his hand, stopped the chase by stepping in front of the mustang. 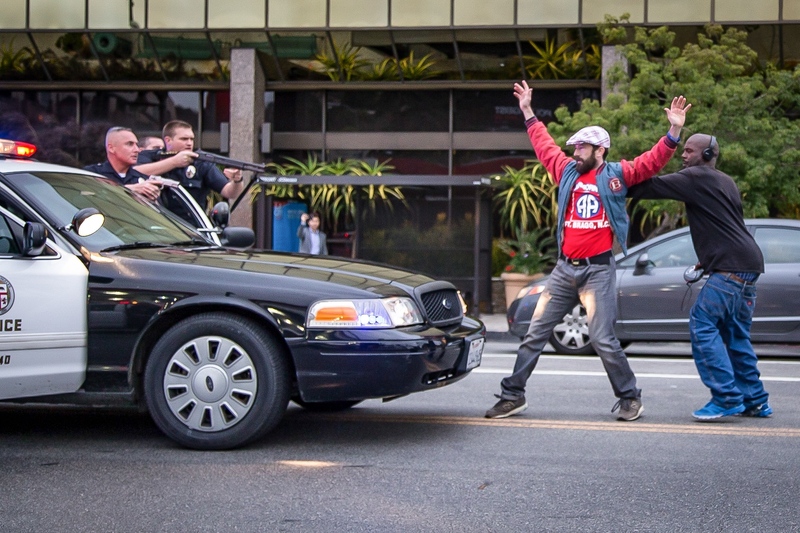 As Levy got out of his car, the homeless man pushed him onto the roof of a police car. LAPD officers had their weapons drawn and they were shouting commands. Both men were eventually taken into custody. The homeless man was later released. But officers say he shouldn’t have interfered. As for Levy, investigators say the war veteran lives with his father and has a history of arrests. As I watched this unfold before my eyes, I thought of all the stories I’ve done on veterans suffering with mental illness. A recent study by Harvard University found the rate of depression is five times as high among soldiers as civilians, intermittent explosive disorder six times as high and post-traumatic stress disorder PTSD nearly 15 times as high. It's crucial veterans get the help they need. 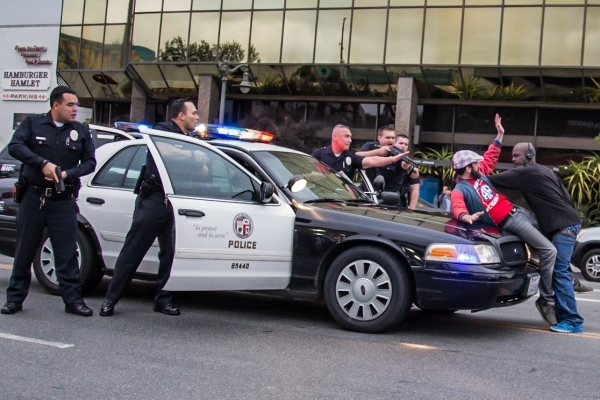 War Veteran Aaron Levy leads Los Angeles Police officers on a slow speed pursuit. After an hour, a homeless man steps in front of the car and forces Levy to stop. 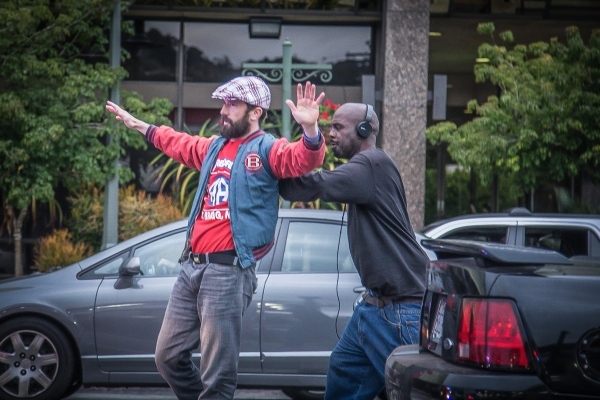 Man forces the veteran to walk towards police officers. LAPD officers are shouting commands at both men. They are not happy with anyone interfering with police matters. 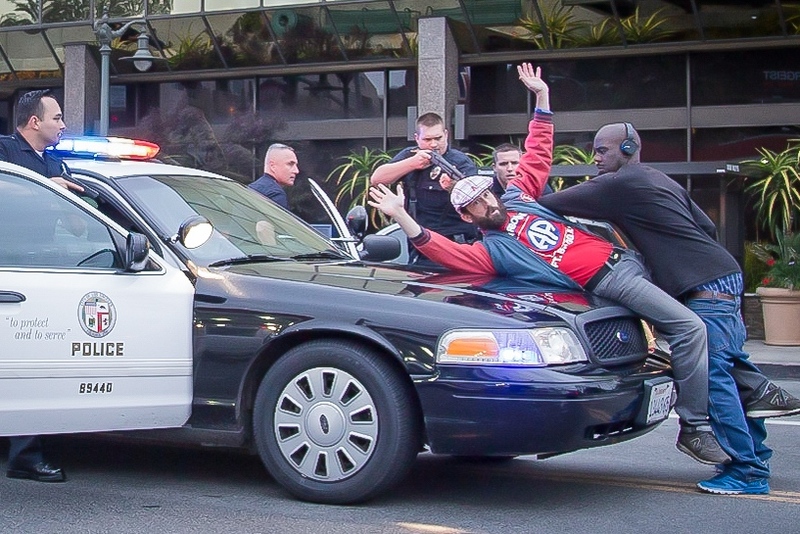 Man with headphones and a portable CD player in his hand, pushes Levy onto the hood of a police car. Police officers tell homeless man to stop and put his hands up. Police confirm Levy has a history of arrests.